Many people think veterinarians have the dream job. Snuggling adorable puppies and kittens – what’s not to love? Fortunately, the public is beginning to understand that our job is actually quite grueling, with life-and-death decisions being made on a daily basis. So with a stressful job, the new puppy appointment on the schedule should be a ray of sunshine, right? I hate these appointments the majority of the time. They depress me more than a euthanasia appointment. Yes, many of you did. You were deceived. It happens all the time. You aren’t the first, and you won’t be the last. It doesn’t mean you’re dumb, or gullible. It means you saw a cute fuzzy face on the internet and let your heart do the thinking. Hearts are not designed for thinking. Most dog lovers these days know not to buy dogs from pet stores – those are always supplied by puppy mills. 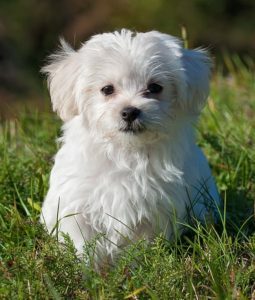 If a person wants to buy a dog, she often finds a breeder online, and buys a puppy. It may be a purebred or some made-up mixed breed that, when sold as “designer dogs,” can command a higher price than calling them what they really are – mutts. She schedules a vet appointment to get the puppy checked out, because she’s a good dog owner. Here’s how these vet appointments often go. The owner sitting in the exam room with the new puppy on her lap is a dog lover. She’d be the first person to sign a petition to stop puppy mills. She’ll spay or neuter this dog, keep it on heartworm preventative, do all the things we vets recommend. She’s intelligent, a good pet owner, a good person, and will love this dog. And she’s the very reason puppy mills are thriving. These appointments make me walk the fine line between telling this client the gruesome truth about where her puppy came from (and risk upsetting or even losing a perfectly nice client) but to gently educate her at the same time. She has a good heart, and if she truly knew the industry she was supporting, she would never have done it. The typical picture on a puppy mill website. The reply is often, “A breeder in [Illinois, Missouri, Kansas, Oklahoma, or Pennsylvania].” Red flag #1. Checking the puppy for fleas, I’ll mention “So that means you didn’t see where mom and dad live? They probably showed you a nice picture?” Newsflash – the chances of that cutesy photo being of the actual feces-matted, toothless, emaciated mother are slim to none. Red Flag #3. I may say “Oh, I see you have registration papers here?” The AKC used to register darn near anything that breathed, but they have tried to raise their standards after a Dateline expose many years ago. They require a little more paperwork, so while mills can still AKC register their breeding stock, they often use other, less strict registries, like APRi, UKC, APBA, or CKC. Registries mean absolutely nothing. If the breeder brags about the registry, it’s a puppy mill. Some AKC dogs are from puppy mills, and virtually all non-AKC dogs are mill products. Red Flag #4. When I look at the puppy I am examining, I don’t see a cute puppy. I see mom and dad living lives of abuse and neglect. I’ve worked for a large humane organization that busted puppy mills. Before that, I’d personally rescued dogs from these horrible places. I can’t “un-see” what I have seen. Instead of fawning over this puppy, I am fighting back tears. Mom lives in a cage where her feet poke through the wires, and the open sores never heal. She has nowhere to lie where she can be out of pain. Her teeth have rotted out, but she has to find a way to eat the hard dog food through the pain, or starve. Mom may not have enough nutrition to grow fur. If she does have fur, it’s often matted to the skin, causing infected open wounds. Some dogs have fur matted completely over their eyes, rendering them blind – for life. Dad might be missing an eye, and most likely several teeth. All that matters is he can still breed. He is terrified of any human contact. All he knows is being grabbed and physically thrown into a cage with a female in heat. His life is one cage to another. The dogs never leave these cages. They never see grass. Some are kept in sheds and barns and never see the sun – ever in their lives. Others are outside in wire pens exposed to all the elements. They are born there, and they die there. They never leave, never see a toy or a leash, and never learn a person touching them can be pleasant. The lucky few that are saved require months, even years, of emotional rehabilitation. Some never can handle a person touching them – it’s just too terrifying after all they’ve been through. Grass, carpet, a squeaky toy – all these are foreign, and terrifying at first. Dogs coming out of puppy mills into homes feel like they have moved to a different planet. 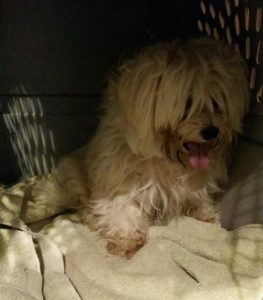 Maltese “breeder dog” on her day of rescue from a puppy mill… sick and terrified. She died 10 months later from health problems that had been neglected her whole life, making any cure impossible. She had 10 great months after 11 miserable years. These images go through my mind as I am looking at the new “cute” puppy. The only way to stop the abuse is for people to stop buying these dogs. I know I am too late with this puppy, but I still need to tell the owner so she can tell her friends, and not let others make the same mistake. She’s a good person. Her friends are good people. They are fabulous dog owners. These are the people who need to learn the truth, and will appreciate it, ultimately. I try to tell my client gently, point out the red flags. I’m not telling her she’s stupid. I’m not trying to make her feel guilty. I’m trying to educate one more person in this fight to stop the abuse. She has no way of knowing the truth if no one tells her. I won’t show her the pictures that I wish I could get out of my mind. But she needs to know. She didn’t want to support a puppy mill. She wants to get it right next time. She walks out of the exam room not smiling nearly as much as when she had come in proudly carrying her new bundle of joy. Things did seem a little “off” with this breeder, the more she thinks about it. Some details didn’t quite seem right when she bought the dog. She even asked the breeder if they were a puppy mill and they said no. Now she regrets not looking into it more. And because she’s a dog lover, she’s sad. Dog lovers are almost universally opposed to puppy mills. Yet, the past 20 years have shown that petitions and laws are not affecting the industry. It’s all about supply and demand. We need education. Yes, it’s a hard conversation to have. No one wants to hear they supported a puppy mill. There is unavoidable guilt, but that’s not the point of the conversation. I want to equip pet owners with the knowledge to make better decisions in the future, even if that process can be uncomfortable at times. That is what this fight needs. Yes, it hurts to learn the truth, but ignoring it only lets the abuse continue. I could smile, grit my teeth and say “what a cute puppy!” like most veterinarians. By taking the easy road and saying nothing, I am promoting the abuse. Dog lovers everywhere need to know, and they need to spread the word. Puppy mills are thriving because of dog lovers buying their puppies! I’m not judging you or condemning you. I’m not trying to put you on a guilt trip. You didn’t know, and you did the best you could with the information you had. I’m not mad at you. I grieve for the dog’s parents. I’m happy you’ll listen, learn, and not repeat this mistake. Don’t beat yourself up. Love this puppy. Give it the life its parents will never know is possible. But tell your friends to not buy from pet shops or online breeders. All of them. Share it on social media. Learn the red flags. Have your friends tell their friends. The only way the abuse will stop is for dog lovers to stop supporting puppy mills by buying their puppies. Where to get a puppy and not support animal cruelty? Any website can say they are reputable breeders, and can use all the right words. How do you tell the good from the bad? You can’t believe reviews, which can be fabricated. It’s tough! The Humane Society of the US has a good article here. The Puppy Project is a growing network of reliable breeders. And your local shelter or rescue group may be brimming with puppies! Petfinder.org and Adopt-a-pet are both great places to start, as well as your local animal control! Posted in General health, Myths & Hot Topics. I know the feeling. It’s a lose-lose. You feel terrible leaving the puppy there. You also feel terrible giving them money, as your patronage keeps them in business. It’s almost going to take a mass act of “tough love.” Dogs are suffering now, in the thousands. They will keep suffering if we keep buying/ “rescuing.” If we stop this, then yes, those dogs do suffer, but the cycle breaks and others are not born to suffer. “Rescuing” that one dog sentences other dogs to the same fate….you just don’t see those. If only we could get the whole country simultaneously on the same page! So how would we go about shutting them down? Is it state by state? Town by town? Could it be approached from a whole country perspective, federally? I know their rules are not Tough Enough. And they’re not policed enough. And people are probably getting paid off sadly…. and I’m guessing there are people that work on this on a daily basis who know more about politics and I do. And puppy mills will continue to grow because people are losing faith in adopting. Prior to 2010, only 5 recorded deaths from shelter/rescue dogs. Since 2010, 50 more shelter/rescue dogs have gone on to kill after adoption. We have people demonstrating in front of shelters calling them killers. What man would take his family to a place where they would see barrels of dead animals according to these demonstrators. The No Kill movement is pushing people into the hands of puppy sellers aka puppy mills. This is an untenable statement. The consumer is in no way responsible or liable for the conditions these dogs are raised in. It’s up to the state (federal or local) to regulate the production of pet dogs. The state has the legal right to inspect the facilities, to bring charges and fines against violators, to educate the producers about ethical dog raising and the like. Think about it, based on this description, the buyer is doing that puppy an huge humanitarian favor. The puppy you’re so grumpy about them buying is already alive like an unwanted child born to hateful parents. It would make no sense to leave such a child in the care of abusive parents in hopes the whole family will die off. It’s no better ethically for people to ignore “puppy mill” dogs as if they were damaged moral produce and let them die in pens or be repurposed as pit fighting dogs. You must demand the state regulate the production of pet dogs, not finger wag the individual consumer for buying a dog in desperate need of a good home. I have mixed feelings on this. On the one hand, puppy mills. On the other? Three separate rescue groups sold my friend dogs which were so aggressive they hunted family members through the house, and so neurotic they were agoraphobic. I have watched two other rescue groups sell my unwitting neighbors on ‘hound mixes’ which were actually pit bulls. Another neighbor can no longer leave her home without her rescue dog, because he is petrified to be more than 2 feet from her side; she walks the dog off-leash with perfect safety as nothing on earth could move that dog to run away. A rescue dog attacked, mauled and nearly killed another dog at the dog park in the next town over last week. To tally – in just two small towns, that’s 7 rescue groups/shelters which got multiple people and dogs attacked and injured, completely changed the lives of multiple adopters and family members *for the worse* by inserting painfully problematic dogs into their homes, and – not least – placed 7 project dogs in normal pet homes which are now struggling, with owners who love them, as dogs are always loveable, but feel endless guilt and grief about them and what they do. All the vet hospitals near me have added vet behaviorists to their staff in the past 5 years, and all of those behaviorists are busy – the one who’s treating my friend’s current dog is extremely busy – it takes weeks to get an appointment. She advocates adoption, but admits most of her clients are rescue dogs. Based on these and similar experiences, I no longer judge people harshly when they shy away from rescue and go to the dubious sources online. Who’s responsible for the continuing popularity of puppy mills? There’s blame to go around, but the rescue world’s new indifference to the safety and happiness of adopters and society is a major factor driving people back to bad breeders. Hi, we did have a similar experience. We ended up with a two year old American Bulldog who had been abused in two previous homes. He was supposed to be good with kids and cats. He bit me, my daughter, my husband, and tried to eat my cat over the course of the week we had him. He wasn’t a bad dog. Just fearful and placed in an environment he had no business being in. We returned him sadly to his rescue foster mom. We ended up getting a puppy from a shelter instead of a grown dog. Honestly, my thought on everything is EVERY animal owner needs to FIRST have a class on animal care and get a license to “own” a pet. ALL of their pets should be sterilized. Animal breeders also need special courses and a license to breed the animals they’re qualified for. I’d leave specific restrictions up to the state, but this will end quite a bit of shelter nonsense and poor breeding. It’ll make people more knowledgeable and run off people who think they’re gonna turn a profit on dogs. Institute breeding limits as well among other things. But the majority of dogs in the shelter are mixed breed Oops litters. The majority of purebred dogs in the shelter are the notorious breeds, known for escaping and or attacking people or animals. Funny, those happen to be some of the more popular breeds. But I’m not sure popularity has everything to do with it. Scottish folds are popular cats but I haven’t found them in the shelter. I think too financial ability plays a role as well. I think people should be able to financially care for their animal. But yeah, if we do a spay/neuter sweep, require licensure and regulate breeders. the shelters will empty. Good breeders take their dogs back, great breeders care for their LINE and care for the breed in general. Breeding limits and take backs will greatly reduce shelter animals and improve the quality of animals. Education will improve quality of life. How can a hoarder hoard an animal they can’t get? They’ve been limited to what their property can hold, what they’re licensed for and each dog is spayed/neutered. This definitely needs to be legislated. Like seat belts, rescue has to clean your brains off the pavement. Animal control has to euthanize. Prevent them from having to kill a completely healthy and good animal. Licensure and classes are also a good source of revenue for the state. I think it’s win win for everyone. and i know some breeders want to fight for their right to have animals and to have them intact, but if you’re doing everything right. Your life won’t change. I see nothing wrong with preventing people from having more animals than they can care for and preventing them from creating unwanted animals, unhealthy animals. what’s wrong with a breeding limit?? plan your litters in advance or try to get a permit/exception because you have enough deposits on the litter to justify the breeding. That’s ways 2 do it. Why would every dog be sterilized? How we you have a breed standard if you can’t breed. How would you continue a breed? There is a new group formed in Chicago called VETERINARY PROFESSIONALS AGAINST PUPPY MILLS OR VPAPM. Banding together so this is a nationwide movement would be a great way to go. You can see them on Facebook and hopefully we can all join forces to educate the uneducated. Who is the veternarian that wrote this article? It is often hard for people that expect things Immediately and buy on impulse. If you don’t want to go to a shelter and find a pup in need, then expect to wait a while for a pup from a good preservation breeder and expect to be questioned on everything about your life and that the breeder wants to see where you live and speak to your current vet. There must be times as a vet, that a client bring in a well-bred puppy whose parents had all their health checks and who will grow into a lovely adult that meets the breed standard. It would be nice to hear how you feel then. I know you maybe do not experience that very often, but our vet loves to meet our new puppy from a great preservation breeder.